← New on CTD: The absurdity of zero tolerance policy, illustrated. For once, I went to the range without a camera. With several guns to fire in a limited time and poor lighting available, I concentrated on having fun. We set up at 25 yards and played for a while. One gun to try was the traditional “girlfriend carbine” M1 .30 caliber, this one from Auto Ordnance. 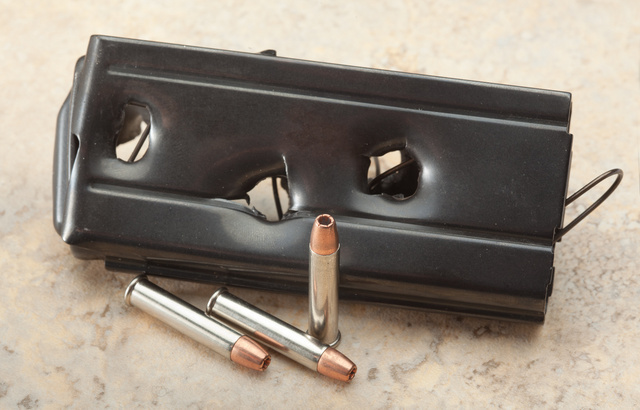 Steel-cased Tula ammunition fired and grouped fine but cycled properly less than half the time. Remington SP worked fine and grouped better. Four of the 15rd magazines (three from Auto Ordnance, one surplus) worked fine, one surplus mag of unknown provenance wouldn’t function because its locking tabs were placed much too high. M1C is fun. Though I love the traditional look, I see an Ultimak rail with a red dot in its future. Since the defective magazine wasn’t useful for much, I shot it up to test 22WMR penetration. Gold Dots were spaced out to provide a better picture of the results, and all of them penetrated both sides and pulled the mag springs out of the massive exit holes. 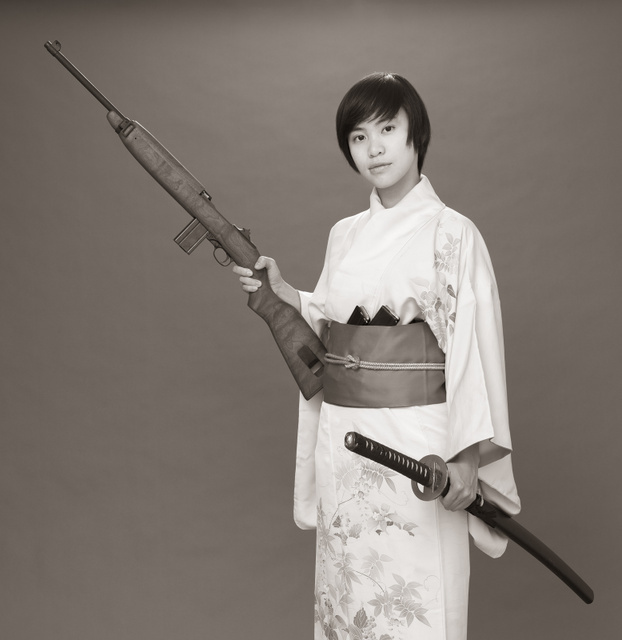 Next up was the Teppo Jutsu .338 Specte AR. After firing several shots without a suppressor to verify stabilization, I out on the Gemtech multimount 9mm can and zeroed the scope. Note to self, replace the no-name 1.5-4.5x scope with something decent. Note two, replace the abominable plastic bipod with no means of correcting cant with a Harris or similar. I had to level the gun by putting an empty ammo carton under one bipod foot. Note three, stock Bushmaster lower came with a gritty, heavy milspec trigger. Something needs to be done about that. Hardware gripes aside, 300 grain Match King loads from SBR work really well. The gun has all the report of a pellet gun. I have not fired it past 25 yards yet, but at that distance the group is about 1/3″. I zeroed it 1.5″ low at 25, will make that right on at 75 once I put on a better optic. The practical limit for this round is about 125-150, but it retains velocity very well and 300 grains concentrated in a .32 caliber bore make for a decent punch-through. Recoil — what recoil? I’ve shot 9mm ARs with far greater kick. Unsuppressed, 300BLK and 330Spectre approximate 7.62×39 in slightly more compact form and with better ammunition available, while the Russian round has the advantage of cost and availability. Suppressed, both 300BLK and 338Spectre come into their own, with performance meeting or exceeding the 9×39 Vintorez cartridge, sadly unavailable in the US. Turns out that I have a house full of 20ga ammunition but only 25 rounds of 12ga bird shot. What 12ga I owned I gave away. Until recently, I owned only a 20ga, so that made sense. I did find about 800 slugs and 200 rounds of buckshot for the 12, so a few of those went to the range. 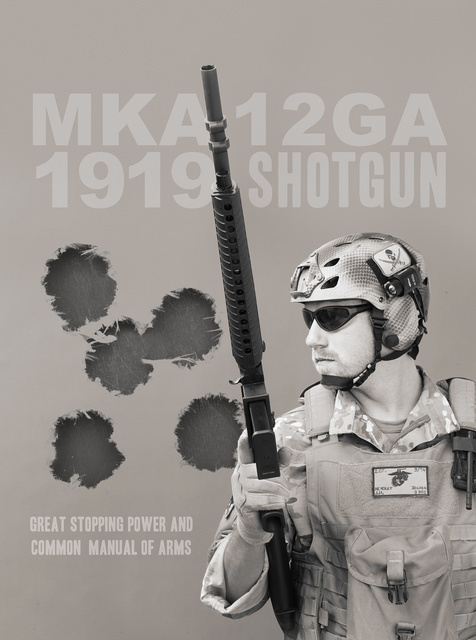 MKA1919 runs fine with birdshot and also with heavier loads. Firing slugs and buck form a 6.5lb gun is interesting: the recoil is soft but noticeable. The best analogy is being pushed and then pushed some more. The cycle is fairly leisurely, so adopting a balanced stance is enough to counteract it. That said, five round can be fired as quickly as with an 1100 or an 1187. Makes sense, considering how similar MKA1919 is to the 1100 internally. The shotguns allows single feed through the ejection port. With the exception of the charging handle, its manual of arms mirrors the original AR15. I think the sights work fine for slugs and buckshot but a red dot would work rather better for wingshooting. It grouped pretty well with rifled slugs and iron sights at 25, I’d like to try Brennekes next with a 1×42 Trijicon Reflex next. I also have a rifled choke for it, we’ll see if that makes a difference. 9 pellet unplated 00 buckshot went into an 8″ circle at 7-8 yards, standard for cylinder bore. The patch is from Milspec Monkey, as usual. 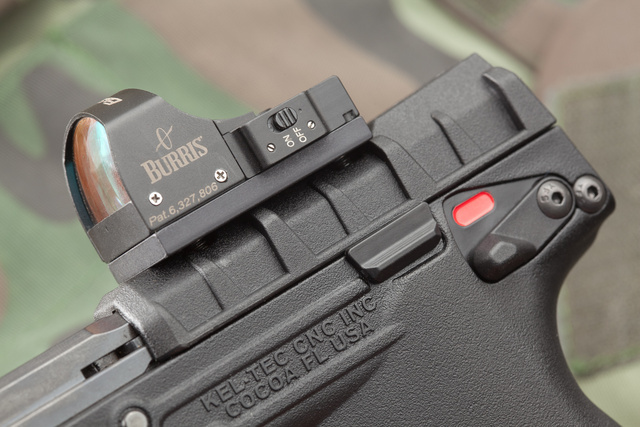 Next, we shot PMR30 with a Burris Fastfire red dot. 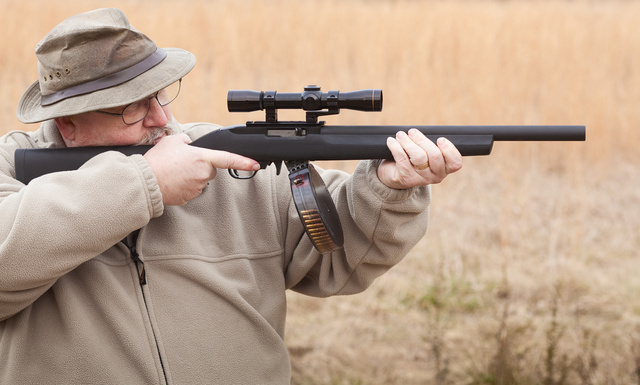 Sight acquisition takes longer than with the stock sights, but the ability to focus on the target means that accurate shooting part 10-12 yards is fairly easy. 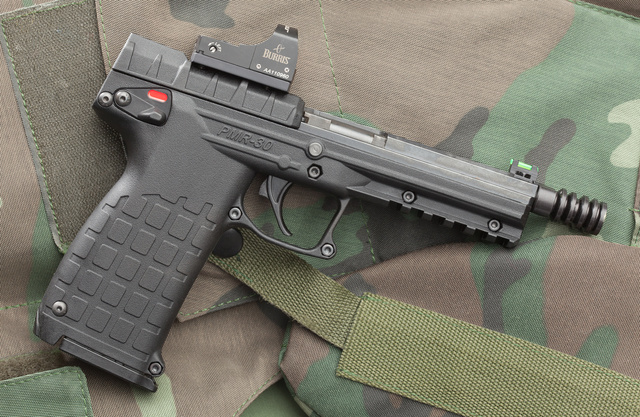 The main challenge came from the super light weight of the pistol itself. The sight adds almost no weight so as to not impede cycling. It worked fine with 30 and 40 grain ammunition. I am not the best long-range pistol shot, so I settled for being able to hit pop cans at 25 yards with every shot. With full cans, the terminal ballistics are spectacular. I think a reliable hit on a rabbit can be achieved out to about 45-50 yards, and that’s pretty decent for a kit gun. The separate power switch, effective auto brightness controller and locks for windage and elevation of the Fastfire impressed me favorably. The 7.62x54R Vepr with 23″ barrel didn’t have to be zeroed, but it was too much fun to leave at home. RPK rear sight meant that windage could be adjusted without a tool, and the ladder rear sight allowed fine-tuning the point of impact for close range plinking. 300m setting also worked for 25 yards, so we turned a few small pieces of sandstone into smaller pieces and dust. Predictably, it ran 100% with Wolf ball. Muzzle flash was visible even in daylight, so a flash hider/muzzle brake would be a good idea. Fortunately, the current Veprs come with threaded muzzles. Of course, the integrally quieted 10-22 with an AAC barrel/moderator had to come out. It’s the gun that makes the Hollywood “whoosh” sound with subsonics and it makes certain friends go “squeee!” Eventually, it needs to get a lower scope mount. 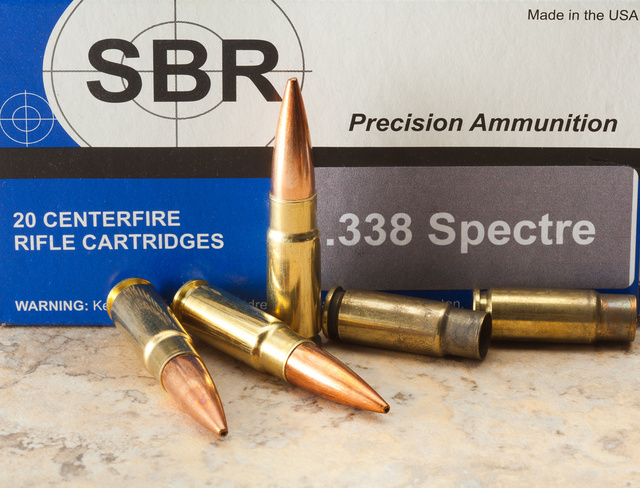 This entry was posted in ammunition, pistol, rifle, shotgun, sound suppressor, training, Uncategorized and tagged 338Spectre, fun, range, SBR. Bookmark the permalink. Guns are dangerous and racist, and you are a domesticated terrorist. The authorities are in route. In other news…as a professional scrounger and cheap-skate, I am appalled at your destruction of the M1 mag. I would have stripped it of the spring and follower before blowing it to smithereens…but that’s just me. Seriously…I enjoy your photographic and journalistic skills. You are a legend. In the past, I would have salvaged parts, but the mag was so grossly out of spec, I doubt the parts were any good. That drum has worked better for me than any box magazines and it’s easier to load. I use it for 10-22, PPS50, AR15 and SU22. Which models of Vepr some with the threaded barrel? All version 2 rifles are threaded in Russian thread pitch, the next batch will be threaded to US standard. Долго смотрел на ствол – так и не понял, как мне пламягаситель на Вепрь нацепить?